A County Clare-based airline has apologised after a pilot mistakenly landed at an Army base six miles away from its intended destination. The Liverpool to City of Derry Airport passenger flight, operated by Eirjet on behalf of Ryanair, landed at Ballykelly airstrip at 1440 BST on Wednesday. 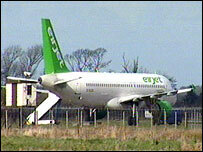 Eirjet said the incident "involved the aircraft landing at a runway exactly in line" with the airport's runway. A passenger said everyone was surprised when they realised what had happened. He said: "The pilot apologised and said, 'We may have arrived at the wrong airport'. "Everyone started laughing and thought it was a joke, then I saw for myself when I looked out and saw Army officers everywhere. "It was just unbelievable, I think the Army officers were shocked themselves (as) they were taking photographs. It was surreal." The 39 passengers were taken by coach from Ballykelly to the airport. 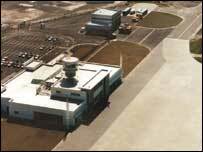 The airstrip at Ballykelly is primarily used by Army helicopters and light aircraft. It was built for huge military planes, making it one of the longest on the island. Eirjet said it would begin a full investigation, working in consultation with the Department of Transport, the Irish Aviation Authority and the Civil Aviation Authority. The airline said it placed "paramount importance on passenger safety". Ryanair said it would be carrying out its own investigation into the incident. In a statement, the company said: "In over seven years of Ryanair flights into City of Derry airport, and over 20 years of Ryanair-operated flights, such a mistake has never occurred before."